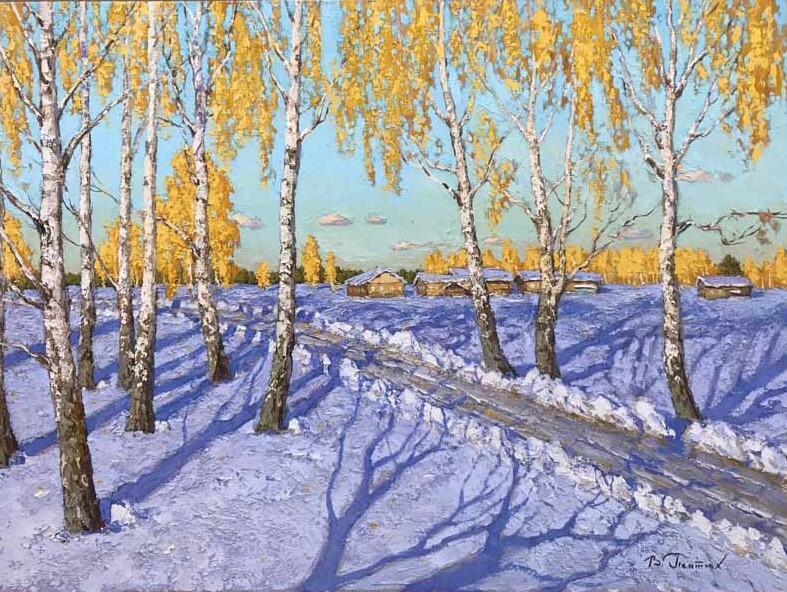 Vladimir Pentjuh was born in 1965 in Penza, Russia. 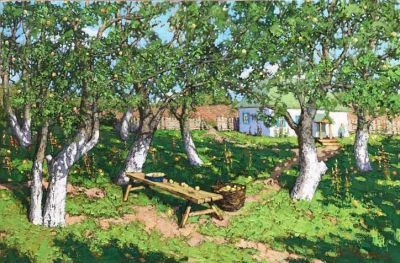 He loved to spend his school vacations at his grandmother's house in the village and loved the peaceful, quiet and serene country life. While studying at school, Pentjuh attended a children's art studio, where the art teachers noticed his gift. 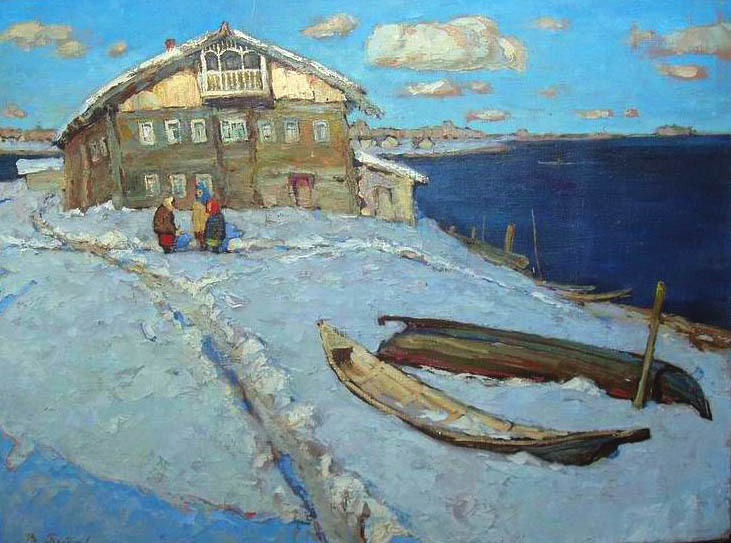 After graduating from high school, he entered the Penza Art College named after Savitsky. He graduated from the Art College in 1989. 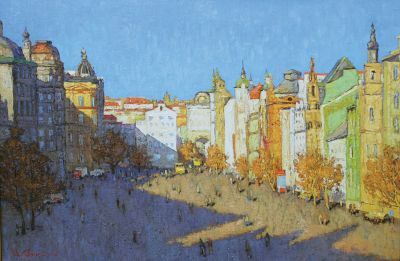 He then studied at Kharkov Art Industrial Institute where he matured as an artist with his own unique art style. In 1996, he became a member of the Artist Union of Russia. Vladimir Pentjuh continues the traditions of Russian and Soviet school of landscape painting. 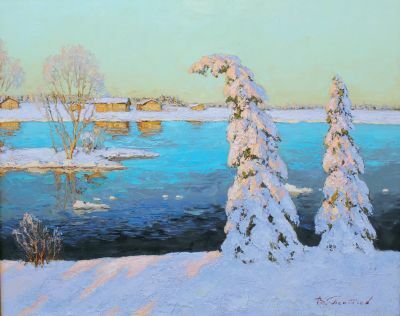 This is manifest in his choice of simple and modest subjects, choice of color and shades, lack of surface effectiveness, and deep lyricism of the landscape. Vladimir became a wonderful successor to the great Russian landscape artists such as Levitan, Vasiliev, Plastov, Korovin, etc. His main motive is to continue in the tradition started by another genius of Soviet landscape paintings of the 60's and 70's -- A. Stozharova. Vladimir's paintings are reminiscent of the French impressionist/post-impressionist works. This is manifested in his focus on the relationship between color, light and shades onplein air. 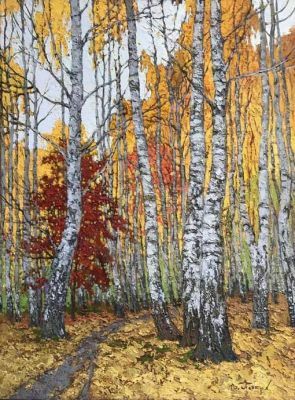 He pays special attention to reflections and shows how they depend on the color and light that project from other objects. 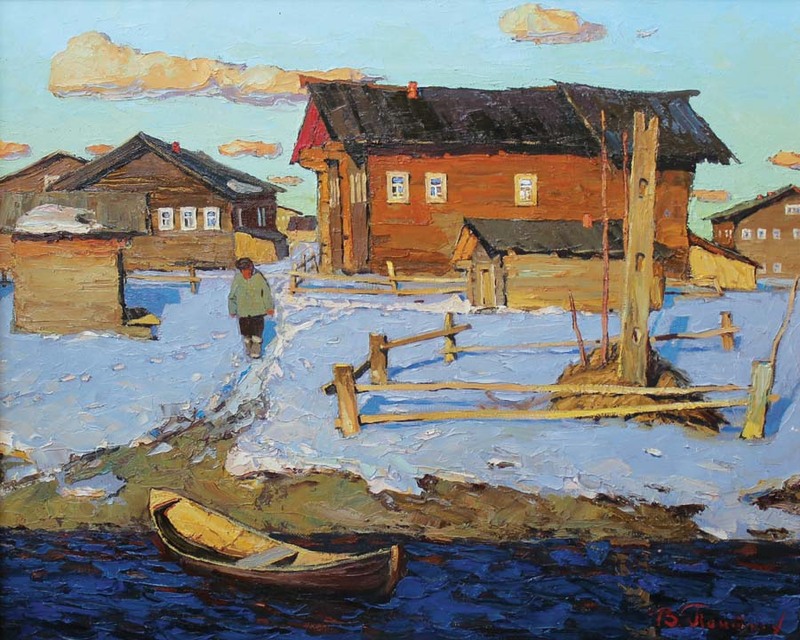 Vladimir traveled extensively in North Russia in search of interesting village landscapes. He often chooses sunrise or sunset time of day when nature is lit with bright, red rays of the sun. 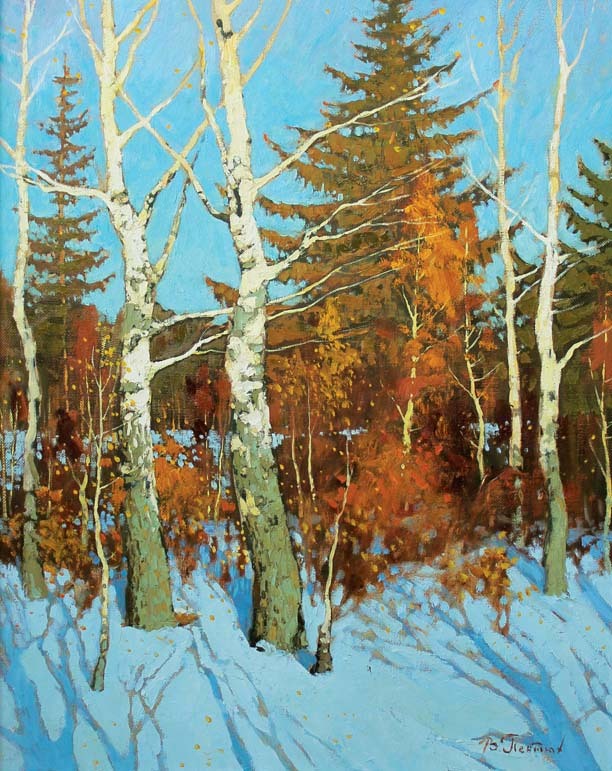 To convey these color changes of nature's transfiguration onto the canvas is the artist's main goal. 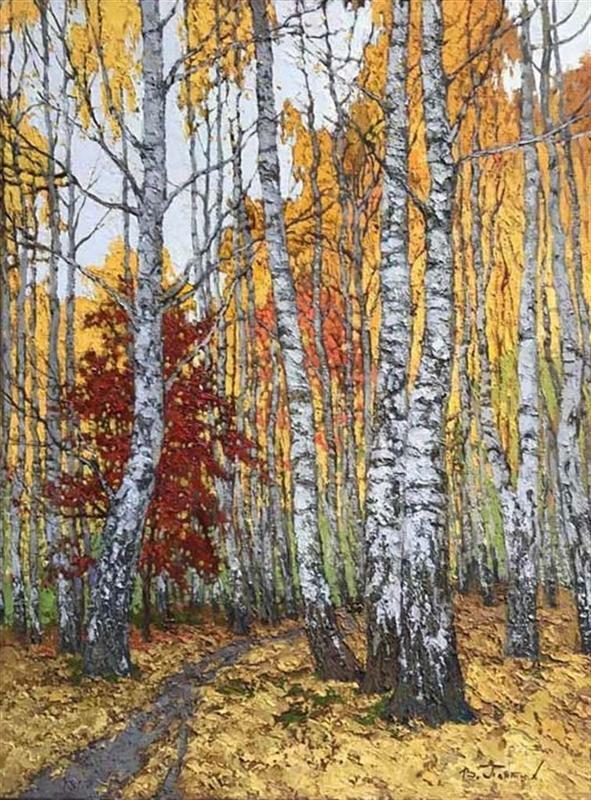 Vladimir Pentjuh's paintings are about the eternal, unchangeable and constant. The feelings of beauty, generosity and joy of life inspire him as they inspired other great impressionists. He enriched the typical vision of impressionists with an optimistic and joyful vision of the world as well as his own love, preferences and choice of subjects. 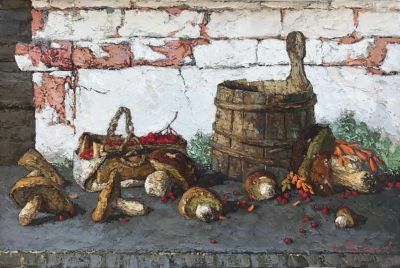 Eternal values -- earth, sun, bread and water -- are main themes of his creative work. 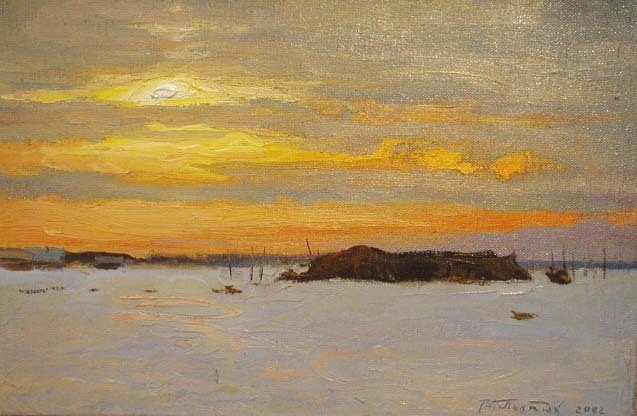 On the earth, he places sturdy log houses and lights them with warm sun. 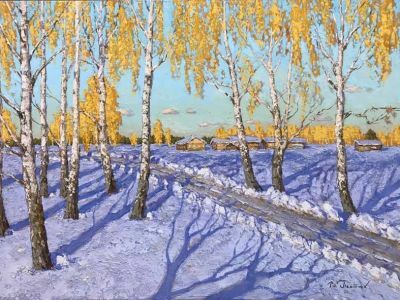 He admires the play of sun rays on the grass, roofs of houses and snow. The landscapes of Vladimir are closed composition. On the foreground he can depict animals and peasants; on the background, a row of wooden houses. 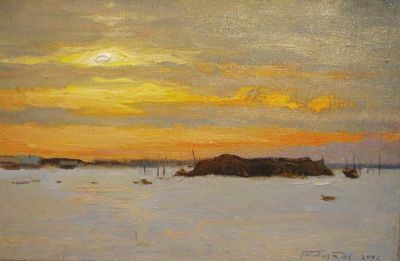 The horizon is depicted on the artist's eye level. This helps the spectator to "step into the picture" and become a participant of the village life. The spectator enjoys the panorama of the Russian village -- endless Russian fields, small rivers, lakes and boats on the banks, dirty roads deformed by the rain.